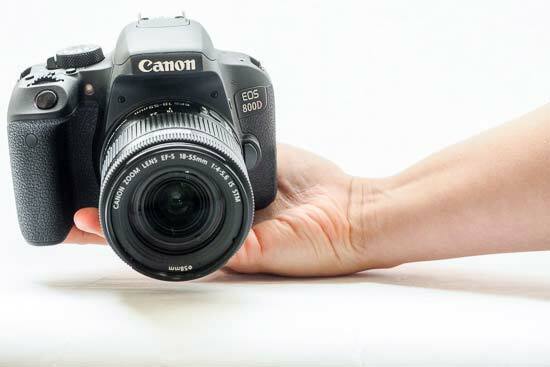 The Canon EOS 800D (also known as the Rebel T7i) sits in the entry-level line-up of Canon’s DSLR cameras. It’s the successor to last year’s 750D, and sits just below the 77D, which is a replacement for the 760D. Canon says it has rethought the naming convention of these two cameras in order to make it simpler for consumers to understand - the three digits of the 800D’s name signifies it is for a more entry-level audience. That said, the 800D and the 77D share a lot of specifications, and the difference in price between the two is minimal. Both feature a 24.2 megapixel sensor, which is joined by the latest Canon processor - Digic 7. There is a 45-point AF system, an optical viewfinder, inbuilt Wi-Fi, 6fps shooting and a vari-angle touch-sensitive LCD screen on both. The main difference comes in the design of the 800D - there’s no top plate LCD or dual control dial. Unlike many cameras currently on the market, there’s no 4K video recording here, but shooting in Full HD at frame rates up to 60p is available. The Canon EOS 800D / Rebel T7i has an RRP of £779.99 / €1,019.99 / $1499.99 body only. 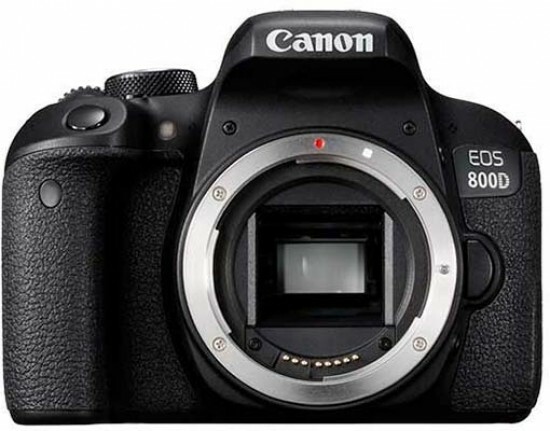 The Canon EOS 800D follows the same kind of design as we’re used to seeing from Canon in this sector of the market. The camera is large and chunky, with a deep handgrip that helps you get a firm hold on the device. There is a covering around the front and side of the camera which gives it a nice texture, but there’s nothing on the top of the camera - this arguably results in a slightly cheap feel. On the top of the Canon EOS 800D you’ll find a mode dial. It contains the usual complement of automatic and semi-automatic modes (PASM, Automatic), as well as a range of scene options. You’ll also find an option which you can use to shoot with digital filters to give your shots a creative look. Around the mode dial is a switch for switching the camera from off to on. If you flick the switch one step further, then you’ll be able to put the camera in video mode. This is a quick and easy way to enter video recording, and is much quicker than having to scroll to a mode on the dial. Also on top of the Canon EOS 800D are three buttons. One controls the camera’s display, one can be used to alter ISO (sensitivity), and a third can be used to alter AF selection mode. There’s a scrolling dial on the top of the camera’s grip which you can use to alter different settings depending on the shooting mode you’re in - so for example when in aperture priority, you’ll find that it controls aperture. In manual mode, you can use the dial for both aperture and shutter speed, but you’ll need to hold down the exposure compensation button in order to switch between the two. Finally, the shutter release button is found in a convenient place to rest just underneath your forefinger. 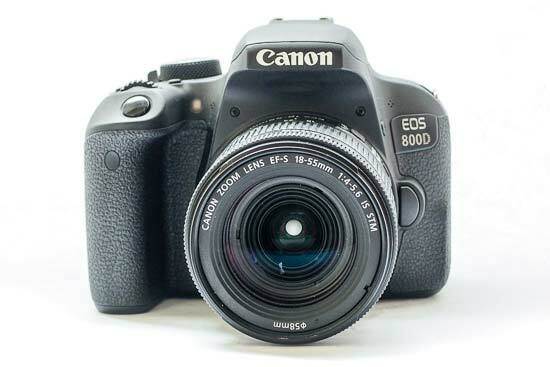 The camera’s flash is found housed on the top of the Canon EOS 800D. To lift it, you’ll need to press a button close to the camera’s lens mount. When you’re done using the flash, you simply push it back into place. Moving to the back of the camera, and the majority of the 800D’s buttons are found on the right-hand side. This makes it easy to quickly change settings using just your thumb - it’s likely your other hand will be engaged steadying the camera, especially if you’re using a large or a zoom lens. There are two exceptions to this rule however. The main menu button is joined on the left hand side by the info button. Neither of which you’re likely to need to press with any great frequency, so it’s easy to understand why they have been separated from the other buttons on the back of the camera. If you’re at all used to Canon cameras, you’ll be familiar with the button layout. There’s a four way navigational pad, with each button assigned to a specific function. The up directional key accesses white balance settings, the left button is for drive mode, the right button is for AF operation, while the down key can be used to change Picture Styles. In the middle of the navipad is a “set” button which you can use to confirm settings changes - it’s also useful for returning to the central AF point. At the top of the Canon EOS 800D’s rear you’ll find the button which allows you to change the AF point, as well as the AE-L lock button. Next to the viewfinder is a button for switching Live View on. During Live View recording you can use the touch-sensitive screen to change AF point, and to fire off the shutter release if you want to. This setup can be particularly useful for macro and still life shoots, where you’re using the camera on a tripod and don’t want to look through the viewfinder. 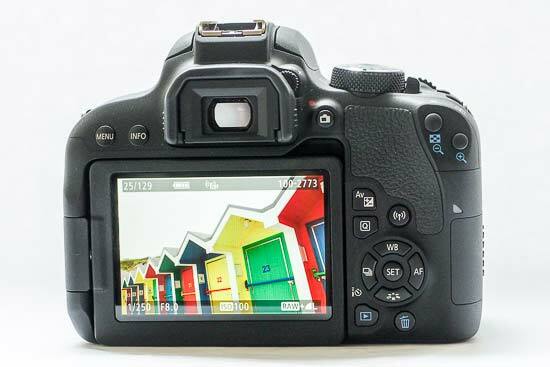 Also found on the back of the Canon EOS 800D is an exposure compensation button, a wireless button (for quickly connecting the camera to your phone or tablet), a playback button and a delete button. A quick menu button is useful for swiftly accessing different commonly used settings - the options which are available via the quick menu will change depending on the shooting mode you’re in, but can include exposure compensation, ISO and aperture. When you need to make further changes to settings, you can find more extensive options in the main menu. The menu is reasonably sensibly divided, giving you options to choose between shooting settings, playback settings and function settings. You can also change some display settings, such as whether or not the camera describes the shooting mode when you change it. 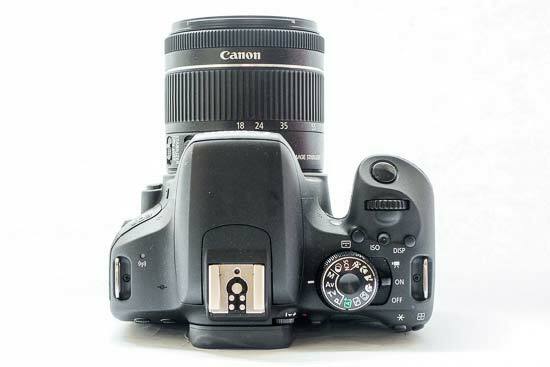 One of the changes Canon has made to the 800D, compared to its predecessor, the 760D is the new graphical user interface. It now has a more “friendly” design, which is likely to appeal to those who are new to DSLR photography. It displays helpful advice and hints on how each of the settings you’re using will affect your finished image. For example, if you change the aperture, it will advise that shooting at wide apertures is useful for blurring the background. The screen is mounted on an articulating hinge which means you can pull it out to face forwards, as well as tilting it downwards and upwards. This articulation is useful if you want to shoot from an awkward angle - but you will have to switch to using Live View in order to take advantage of it. The screen also folds into the body of the camera, which is great for keeping it protected from scratches and so on when not in use. As the Canon EOS 800D is a DSLR, it features an optical viewfinder. Many prefer optical finders over their electronic counterparts, but it’s worth noting that this optical finder offers only 95% coverage. That means that it’s possible for things to creep into the edges of your frame that you didn’t notice during composition, or for it to be not quite as you intended it to be. It also can’t show you how changes to settings will affect the final image, nor show you a preview of the shot you’ve just taken. It’s quite a bright and clear viewfinder though, with a display showing some key shooting information along the bottom - such as aperture, shutter speed and ISO. Generally speaking, autofocus speeds are quick and accurate when using the camera in good light. Changing to AI Servo mode allows you to track a moving subject - the 800D copes reasonably well with movement which is not too quick and is moving in a predictable pattern. Shooting at 6fps should give you enough scope for some gentle sports and action, but you may struggle to capture super high speed action. In lower light, the Canon EOS 800D still does well to lock onto the target most of the time. It is very unusual for a false confirmation of focus to be displayed. In very low light, the lens may hunt for a while - depending on the lens you’re using, but it’s only the absolute darkest of conditions that the camera fails to lock on to a subject at all.